Best of Show round judging. Thanks to +Russ for the image. There were a lot of great beers pouring (full list included below) and there was stiff competition across the board. Overall, the scores from the judges were higher than in past years. A big thumbs up to the entire staff at The Noble Fir for another great year. 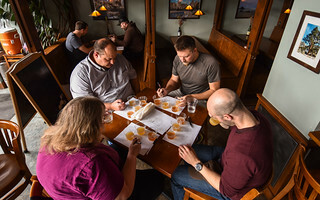 Also, a big thanks to the judges that participated and the breweries that were a part of the Throwdown. This event is a always a lot of fun. 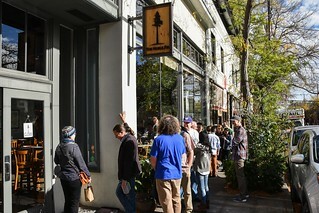 The line to get in at opening was not as bad as in past years. Thanks to +Russ for the image.